If you're looking to replace a shower door or remodel your bathroom with a new, frameless shower enclosure, let the experts at Thompson Glass assist you with your design and installation. 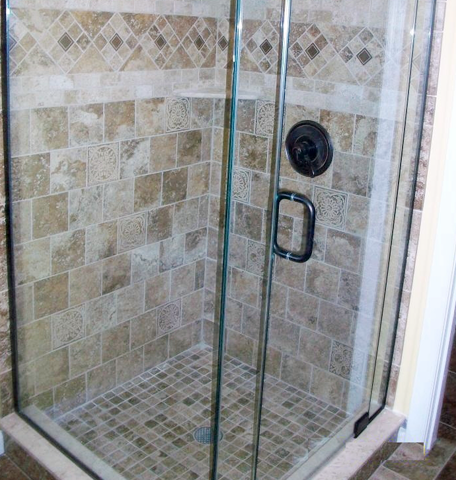 We provide custom showers for residential and commercial uses. It is important that shower doors be fully functional, and what we offer is a custom, frameless shower door and enclosure that will fit any size bathroom. We use top industry name brands, such as EASCO Shower Doors Company and Century Shower Door, both New Jersey manufacturers, and C.R. Laurence for frameless door hardware for the shower door and frames. When using EASCO and Century, you have endless possibilities to choose from. They offer an array of options for a frameless shower door, including curved and sandblasted glass. You can also choose etched or patterned glass with chrome, silver, acrylic, or clear hardware finishes. We have many variations that we can create for you for a customized look. We also have coatings that allow water to run off of the door and make it easier to clean the glass. To complete your bathroom renovation, we have shower accessories, such as towel bars, as well as shower squeegees to keep the glass clean. Visit our showroom for a design consultation to look at samples and to get a better feel for the type of shower design you would like us to create. We offer drawing renderings to capture your vision and will give you a free estimate.